ComTech was founded in January 1998 with a vision of providing an array of products and services to the manufacturing industry, At first, Com-Tech focused solely in the integration of robotic systems. As of today, Com-Tech has grown in size to over 40 employees and resides in a 50,000 sq. ft. facility in Dayton, OH. In addition to our staff of engineers and technicians, we have a machine/fabrication facility in-house so that we have control of all facets of a project. ComTech has a staff of engineers and technicians that not only build and integrate new systems, but can also provide field service. 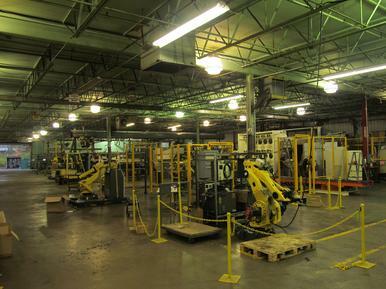 We have integrated over 350 robots and numerous other types of specialty equipment. We currently integrate over 50 robots annually. Applications that we have provided solutions for include material handling, dispensing, material removal, testing equipment, welding, and vision systems. Why Choose ComTech as your solution provider? of our products in Dayton, OH. maximize efficiency and save money. solutions on time proven designs. provide training classes, 24 hour field service, and phone & web support.